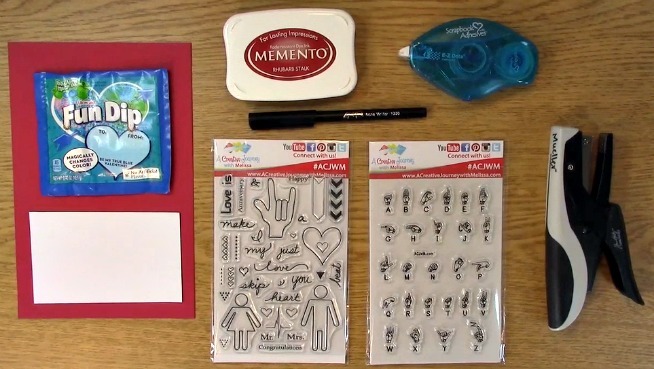 Kid Friendly Crafts – Valentine Treat Holders is what we have for you today. I was very fortunate and grateful for being a room parent for both of my kids. Actually, my husband and I were BOTH room parents. I couldn’t have done it without him. When it was a holiday, I loved creating something for my children’s classmates. I tried to create something that would also work with what the teachers were doing in the classroom. These treat holders will do just that! 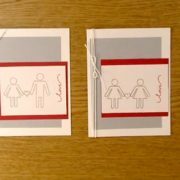 This is the Kid Friendly Crafts – Valentine Treat Holders Project that we are going to create! It is perfect for you to create yourself or make it a family project! Simple for little ones to help with too! 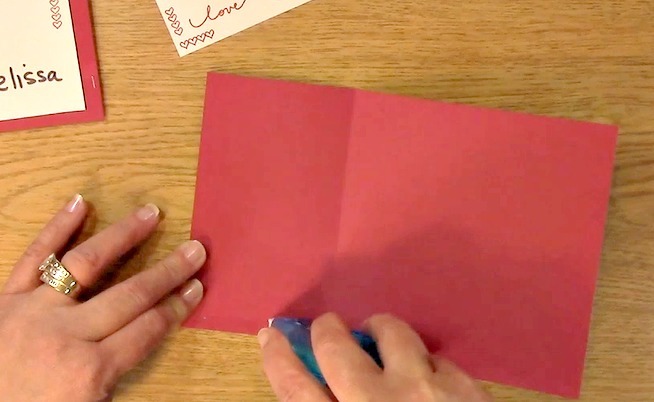 To begin the Kid Friendly Crafts – Valentine Treat Holders Project, take out your paper to stamp on, sign language stamps, red ink pad and stamp block. Place your stamps on your stamp block. 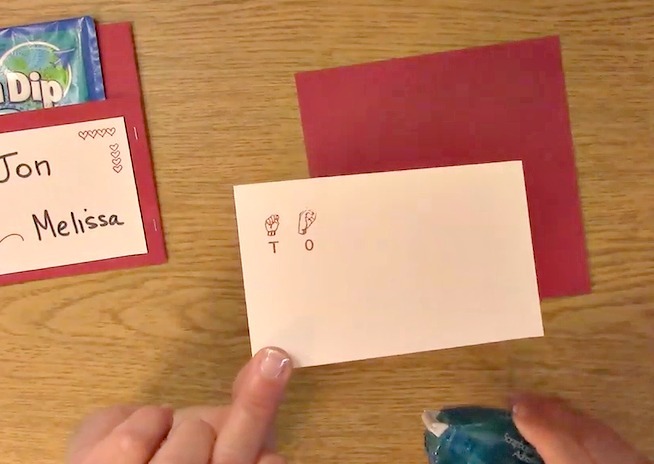 Ink your sign language alphabet stamps and stamp them on your paper. 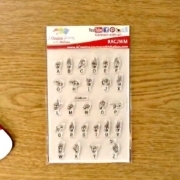 Clean and remove your stamps, placing them back on their sheet. Place your love stamp from your I Just Love You stamp set onto your stamp block. 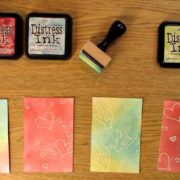 Add ink to your sentiment and stamp your word onto your paper. Clean and remove your stamps, placing them back on their sheet. 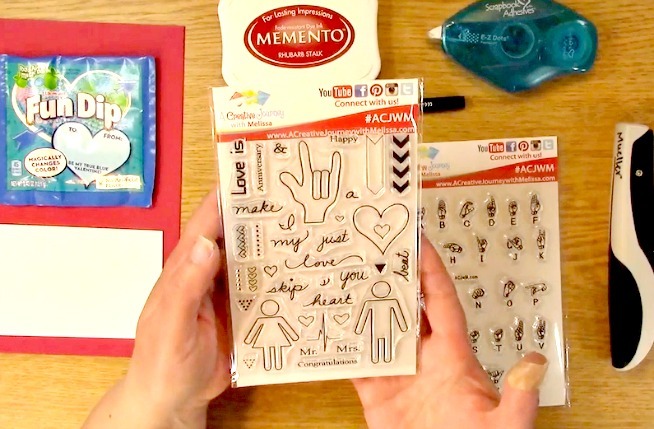 Take out your heart stamps as shown above from your I Just Love You stamp set. 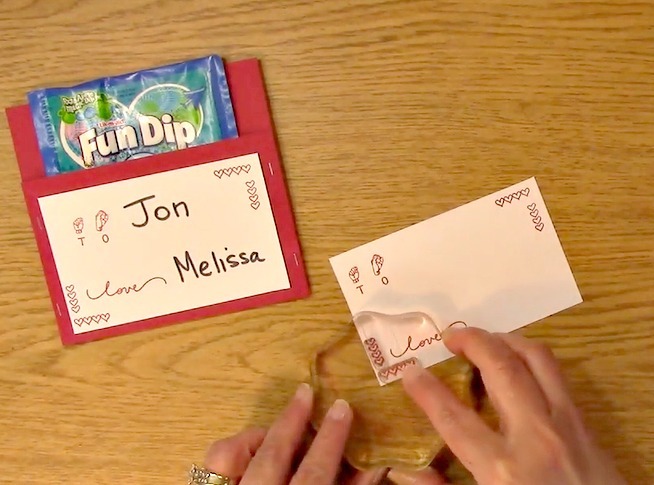 Ink your stamps and stamp your image on the upper right hand corner of your paper. Repeat for the bottom left corner by moving the vertical hearts above the horizontal hearts as shown. 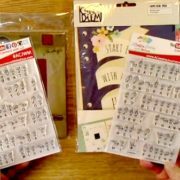 Clean and remove your stamps, placing them back on their sheet. 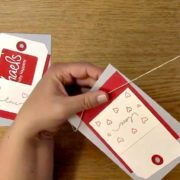 This is what your Kid Friendly Crafts – Valentine Treat Holders Project looks like once you have stamped your images and sentiments on your paper. 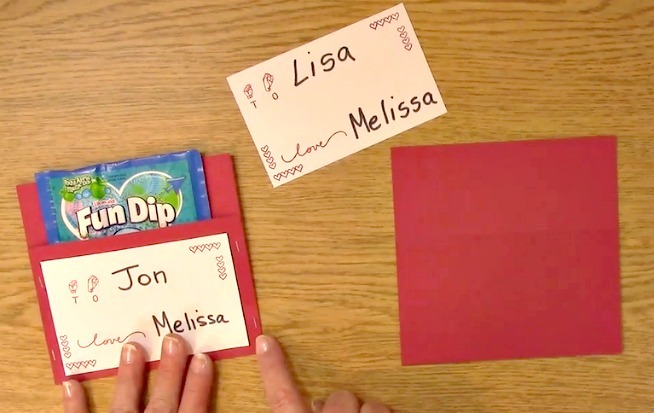 Have your child write their classmates name and sign their name on the tag. I would suggest they use pencil in case they make a mistake. For older kids, using a pen may be preferred. Take out your treat holder paper. You can choose to fold the paper more or less depending on how much of the treat you want exposed. For the example, I chose to fold it more so less of the treat would show. With this creation, I am going to fold it a little bit less so more of the treat would show. For this demonstration, I decided to use adhesive to adhere the sides of the treat holder. 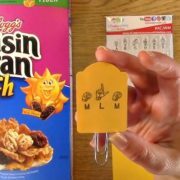 Place adhesive on either side of the flap. Do not to all three sides or else you won’t have an opening for the treat. In my example, I used staples. Either way works great. If you have little ones, they may be more excited to use the stapler. 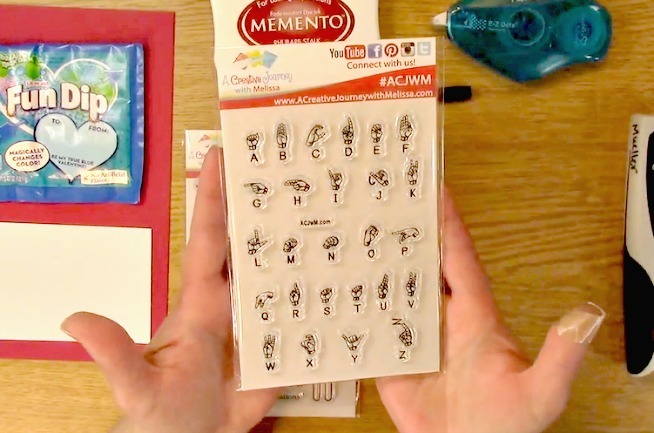 The first time I stamped the word TO with my sign language alphabet stamps, I didn’t press all of the way and I got half of the image. What does one do when that happens? TURN OVER THE PAPER!! In this case, we will be placing adhesive on the back of this paper so we can adhere it to the treat holder. 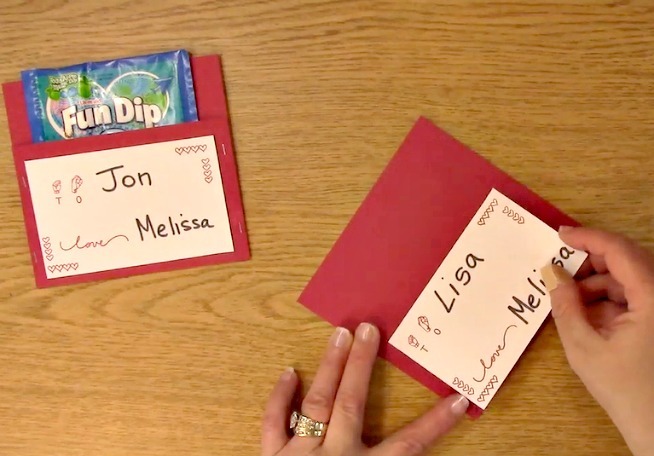 Place your Kid Friendly Crafts – Valentine Treat Holders Project label on the front of the treat holder. 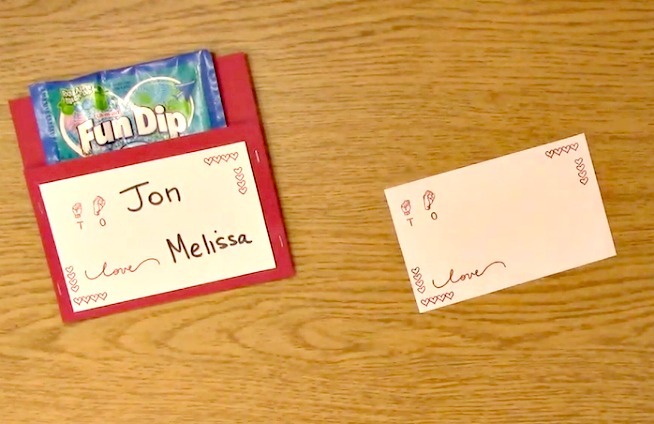 I chose to use Fun Dip for our treat filler. You can use any treat really however be sure to ask the teacher if any of the students have any allergies. We want to be sure that the treats are all inclusive. You did it! 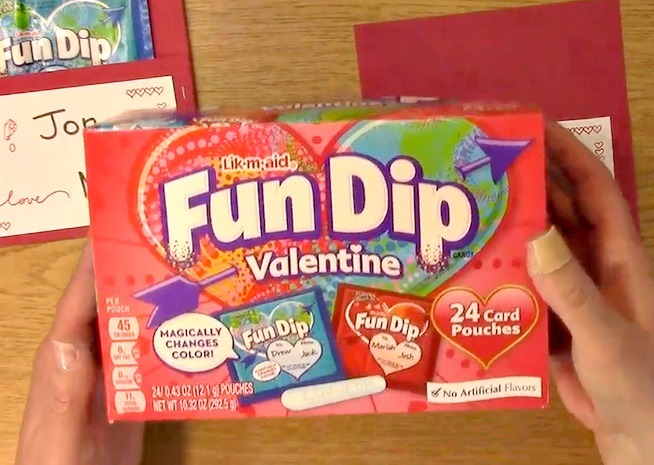 You created your Kid Friendly Crafts – Valentine Treat Holders Project! How fun was that?! 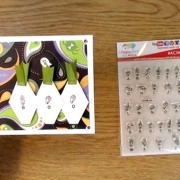 Now for this weeks giveaway, we are giving away two stamp sets. the second is A Creative Journey with Melissa I Just Love You stamp set. For our giveaways from last week, a store credit so you can pick out your favorite item in our store! Please be sure that you send me a message letting me know which post you won on and your contact info and I can get your prize out to you! The winner is Jessica M! Winner, please send me an message HERE and I will get your prize out to you!